Across an 18-year professional career, Jose Mesa was known as a fierce competitor on the mound and one of the most reliable closers in baseball. 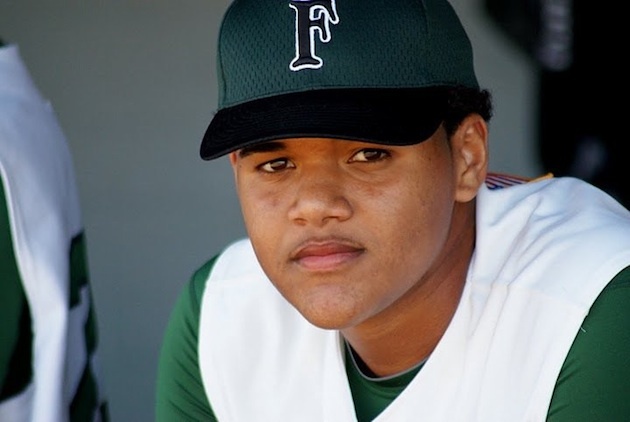 At the age of 18, Jose Mesa Jr. is best known for looking like his father and delivering mean fastballs and sliders that have some thinking he might reach the professional level himself, just like his Dad. As reported by the Miami Herald, Mesa has emerged as a legitimate ace and overpowering talent for Miami (Fla.) Charles Flanagan High. The senior sports an impressive 1.03 ERA, boasts a Broward County-best 127 strikeouts and has walked just 36 hitters in nearly 75 innings. Even more impressive is Mesa's performance against one of his squad's biggest rivals, West Broward (Fla.) High. In two games against the Bobcats, Mesa has thrown two no-hitters. He'll even get a shot at a third no-hitter against the same team on Tuesday, when Flanagan faces West Broward in the regional semifinal round of the playoffs. On Thursday, Mesa tuned up for his big regional semifinal face off by striking out 12 batters in a 6-1 victory against Ft. Lauderdale (Fla.) Stoneman Douglass High, a win which pushed Mesa's season record to 9-1. Regardless of how Mesa's fourth outing against West Broward turns out, the teenager has done more than enough to raise the eyebrows of plenty of professional scouts. At 6-foot-4 and 225 pounds, the younger Mesa already has the frame of a Major League pitcher. Combine that with his pedigree, and it's likely that someone in the forthcoming MLB Draft will be interested enough in his services to make him a relatively high pick. 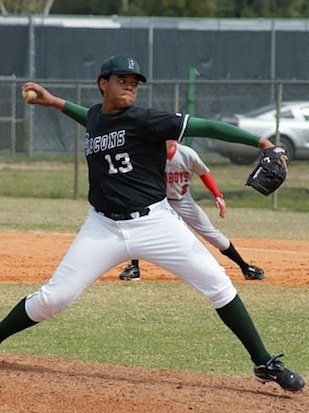 "He's probably right now, in talking to most of the scouts, he's definitely the best [pitcher] in Broward County," Flanagan baseball coach Ray Evans told the Herald. "He's got four pitches and we don't even use one. There's no reason to use the changeup when he's throwing that hard. That's a pitch they could actually hit. "I haven't seen a guy [grow] from his 10th grade year to his senior year like he has, the strides he's made. He's gotten to a point where he for the last couple weeks he was sort of stagnant. He was throwing and they weren't hitting him, but he wasn't getting better. But this game tonight proved a lot. He got stronger as the game went along, sharper with his breaking ball, sharper with his slider. He took command. I think he's one of the best, if not the best." If that doesn't materialize, the Flanagan senior will attend Seminole State Community College, where he'll keep trying to improve while chasing the heights his father once reached.